The Political Dad: Making the right choice. When change is upon us, as it is throughout the world, how does one sift through the rhetoric of both sides and glean what little truth remains? There is extreme hyperbole on all sides and I think the same is true of every community in America. Consensus is not the answer; remember that most people are wrong about most things most of the time. 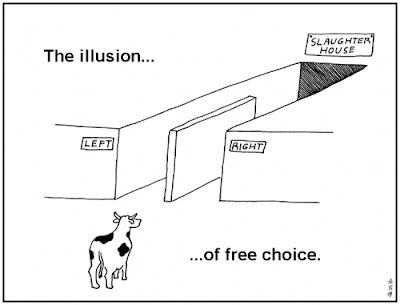 Choosing a path that is an agreement of direction based on a compromise from those who all want to move in a different direction only serves to ensure that no one is moving in the direction they wanted and in fact relegates the masses into a role of subservience rather than the goal of living by the truth, even if you don’t know the whole truth. That is why we don’t live in a Democracy, ours is a Republic. Why would we consider our politicians and leaders any less susceptible to that reality than the rest of humanity when they fall prey to evils of Democracy and gauge their actions as a leader based on the focus of a group or the winds of change? In fact, I would postulate that those who profess to lead us are more prone to the hyperbole they create, believing the magnification of their own contrived data and the ever-present yes-men that surround them. They may even believe they are offering us options for a better life but their opinion of what choices we should have are based on their faulty perspective, a perspective that is constantly clouded by their myopic judgment and clouded view of themselves and their self-importance. This is not a purely American phenomenon, every country, every nation and kingdom has its own self-perpetuating, in-doctrinal mechanism designed to forestall the rise of truth over promise Hyper -Governmental Mitosis that is continually separating facts and truths and expanding like a cancerous growth. As we listen to the promises given by those who profess to lead us, our lives should be perfect. There would be no hunger, no war, no poverty and no reason to worry about anything, our lives would be idyllic and flawless, remind you of anyone? Combating ignorance must be an individual effort designed in part to overcome the witlessness of those who promise perfect skies forevermore. Our need to stand united for the truth is perhaps more important now than ever before. The escalation and division of what is considered right and wrong have never been wider or more intense and our ability to choose has never been so narrow. This is not about being liberal or conservative, though I wish it was that simple, it’s about acting and doing what is best. There are truths to live by that need to be agreed upon and followed. Our leaders should be better than us, not examples of the excuses we all live by or the reflections of what we see every day. Our responsibility is to foster those who are capable, better than us and follow those precepts that our Founding Fathers established in the Constitution and Bill of Rights, not their own personal aggrandizement or self-worth. We want leaders who lead and not just make laws that separate them from us. We want leaders who live better than us, giving us examples to follow so that our lives can become better. It’s not about choosing the right; it’s about the right to choose and then choosing the right. When we take that fundamental right and portion it out to only those we think should have those rights, everyone rights are ultimately diminished as what is happening with free speech. There are so many variations of what is right, who is right, that the decision regarding what is right falls into the category of let’s agree to disagree. But in the realm of the right to choose the value of choosing for choice only grows more influential as others partake. With each choice, the inalienable right to choose continues and grow allowing others the same privilege. Populations are controlled primarily through fear and the limited choices forced upon them. Through our Republic, we have the right to choose those who will represent us as we believe we should be represented. The problem is that those who currently hold those positions are less capable than those they represent. The litmus test for voting is not listening to the promises made but to delve into the background of the individual and see what they’ve done to promote those freedoms to choose. A note to the pro-choice crowd: choices are essential, but the timing of each choice is critical. We need to all make choices that expand our ability to choose not to limit them. A good example is a man standing on a bridge wanting to die. As long as he stands and contemplates his position he always has a choice, once he jumps the choice is gone, never to be regained. Choices are very much like that man. With each choice we make we either expand our choices or limit them. Gravity, in this case, would be the consequence of his actions. No matter how much he wishes to change his choice the instant he decided and acted upon that decision the consequences take over, as it is with all of our choices. Most are not so dramatic or clear but nature, God, Kismet, whatever you want to call it has placed an irrevocable effect on each and every choice we make. Whether at an election for political leaders or a simple choice of right or left the choices we make have consequences. Making the right choices is a mind-boggling exercise but If we try to choose choices that give us more freedom to choose than our choices will be the right ones. Choose correctly now so that your choices and the choices for others will remain intact.